Located minutes away from Orchard Road and at the charming enclave of Novena, Oasia Hotel Singapore is a new hotel that offers both business and leisure travelers more than a welcome respite. 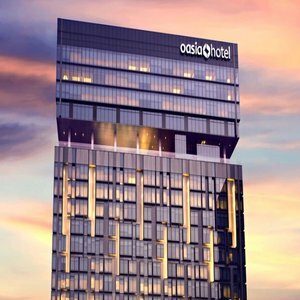 Oasia Hotel is well connected to major expressways and is within easy access to Novena Mass Rapid Transit station, shopping malls, local and international food outlets. 3-minute walk to Novena MRT Station, 3-minute walk to Velocity and Square2 shopping centre, 5-minute train ride to Orchard MRT Station, 5-minute drive to Orchard Road, 10-minute drive to Central Business District, 25-minute drive to Changi International Airport. Just minutes away from Orchard Road, Oasia Hotel Singapore by Far East Hospitality is directly connected by underpass to Novena MRT Train Station and Novena Square 2 Mall, the first and only hotel in Singapore to do so. The hotel offers quick access to the Orchard Road shopping belt and the Central Business District. The 428 air-conditioned guestrooms feature designer interiors and fittings, and offer stunning views of the city-state. Each room comes with an iPod dock, tea/coffee making facilities and a flat-screen TV with satellite channels. The private bathroom features a rain shower and toiletries, with Thann premium amenities available in the Club rooms. Wi-Fi is complimentary and available throughout the hotel. Club guests can enjoy breathtaking views of the urban landscape at the award-winning club lounge, The Living Room, situated on level 22. With its own private pool and barista service, The Living Room is the ideal place to unwind and enjoy evening cocktails or a nice cuppa. Breakfast is available at the exclusive lounge, with a dedicated egg station serving 11 types of eggs.